The Grafton HotelHigh standard of cleanliness. Free car park and on street parking, The Grafton is situated on the promenade in the popular Victorian town of Llandudno. It provides the ideal setting for a relaxed get away where you can take stroll along the promenade surrounded by stunning scenery. Close to shopping, theatre, conference center, walks and golf courses. All rooms are newly decorated with en suites. Various types of rooms, including doubles, twins, triples and interconnecting quadruple suites . Many of which have breath taking sea views over looking the promenade and Great Orme. Your stay will include a hearty full cooked breakfast served in our sea view breakfast room. High standard of cleanliness. Free car park and on street parking, The Grafton is situated on the promenade in the popular Victorian town of Llandudno. It provides the ideal setting for a relaxed get away where you can take stroll along the promenade surrounded by stunning scenery. Close to shopping, theatre, conference center, walks and golf courses. All rooms are newly decorated with en suites. Various types of rooms, including doubles, twins, triples and interconnecting quadruple suites . Many of which have breath taking sea views over looking the promenade and Great Orme. Your stay will include a hearty full cooked breakfast served in our sea view breakfast room. 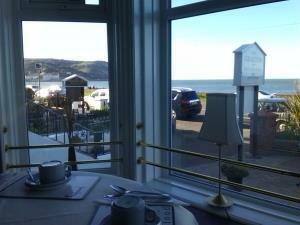 Our attractive breakfast room offers stunning sea views of the promenade and Great Orme, views not to be missed. You can choose from our tempting hearty cooked breakfast to a lighter style, the choice is yours. We also a free car park, Free wifi throughout, Free View Digital Televisions and complimentary tea and coffee making facilities in all of the rooms. Towels and toiletries provided too. Children welcome from any age.